I have found myself being surprised by the date. October already? It’s a common theme and topic of conversation, how quickly the months seem to fly by. We are intrinsically linked to the flow of the seasons and still gauge the passing of time by seasonal milestones. The passing of time can also feel more quickly paced at certain times than at others. Time can reflect achievements, goals and challenges, deadlines missed and tasks yet undone and we often dwell on the past or constantly plan or worry about the future.. The practice of Yoga allows us to be more present in the moment – something which is nowadays often called Mindfulness. 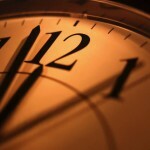 More important than the ticking by of seconds, hours and weeks, is what is occurring RIGHT NOW. Indeed, the only thing we can be absolutely certain of is what is happening right now. More than that, it’s about developing awareness, focusing in and being mindful of what is occurring, with our breath, in our bodies, in our minds. Off the mat, it is about being fully present in our lives. It may not be possible all of the time, but the awareness that comes from practising yoga can give more meaning and depth to our experience of each moment.